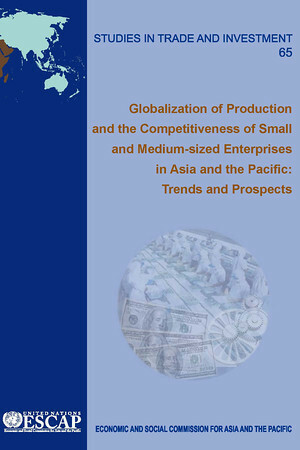 The principal aim of this publication is to fill a perceived gap in policy-related research and understanding of the development of the small and medium-sized enterprise (SME) sector in the Asia-Pacific region, in the context of a rapidly changing and mutating international business environment. To foster growing national economies, policymakers in virtually all countries are expected to facilitate the entry of new business ventures and to increase the competitiveness of SMEs. SMEs typically account for the vast majority of companies in an economy, create the majority of employment, and are responsible for a substantial number of technical innovations in various sectors. Thus, their growth and survival are critical for sustainable and inclusive socio-economic development under intensified global competition. However, the outbreak of the global economic crisis in 2008 added to the challenges faced by SMEs—and policymakers seeking to support the SME sector—in an increasingly volatile international business environment. SME development is a key ingredient in the policy mix that will allow international business to return to healthy growth and permit Asia-Pacific economies to return to robust and inclusive growth. Although considerable research has already been undertaken in this broad field, many developing countries in Asia and the Pacific lack a comprehensive understanding of the rapidly changing needs of the business sector—a result of the ongoing globalization of production—and how such needs should be taken into account in the design and implementation of effective enabling policy frameworks for SME development.